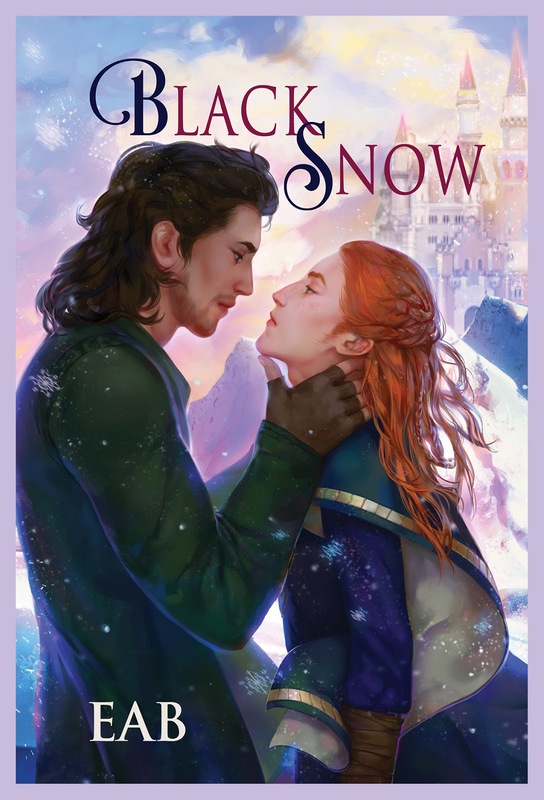 Today EAB visits my blog to share new MM Fantasy novel Black Snow. They were both sopping wet from the storm. Roland was able to set up camp under a large oak tree leading toward the Black Forest and assembled the tent to keep them warm and dry from the drizzle. It was made of deer hide with a leather coating to protect against the rain and insulate in the colder months. There was enough space to start a fire inside, but neither of them had the dynamism to manage it. Instead, Roland lit a small oil lamp to give them some light in the pitch-black tent. He did not know how long the storm would keep up, but Brier was soaked to his first layer. “You should take off your wet clothes,” Roland told Brier as he began to strip away his own wet garb. The last thing he wanted was for Brier to fall ill after such a close call, though the concern Roland felt was unexpected. As a younger man, he’d learned an important lesson of life. That everyone died eventually, whether from old age, plague, or an arrow to the heart. They were all dangling on an inescapable cliff, holding on just a little longer. Death was always imminent. Roland watched Brier take off his heavy traveling cloak and then a tattered jacket with missing gold buttons and faint, green embroidered designs on the breast. Then he stopped and looked up at Roland with wide eyes and faintly red cheeks. “I know I am safe….” Brier muttered. “You won’t be all right if you’re dead from a rain fever.” Roland tossed the blanket in Brier’s lap and scowled. He sounded like Lei with his worrying. Why was he making such a fuss? “Turn away?” Roland asked incredulously. Brier’s jaw hardened and Roland crossed his arms against his broad chest. “Why do you shield yourself? Are you hurt somewhere?” Roland demanded. “It’s nothing like that!” Brier cried out. He breathed steadily and shook his head. “Just—trust me, okay?” They stared at each other for several seconds before Brier gritted his teeth and said, “I’m not taking it off until you do.” Roland huffed as he stomped to the other side of the tent. He could hear Brier shuffling to take off his wet shirt. Roland thought to peek while he undressed—just to make sure he wasn’t hiding any injuries, of course. However, he quickly dismissed the idea as both childish and overly dishonest even for him. Perhaps Aurelians had some silly rule about modesty to uphold. Not that it should matter for a man to see another man. If Brier was a woman, Roland could understand the prudence somewhat, but certainly he should not be embarrassed around Roland. Or rather… why would he be embarrassed around him? What was he hiding? By the time Roland had turned back, Brier had the blanket thrown around him. Roland eyed him suspiciously. Brier pulled the cover closer to hide his pale shoulders completely. “Will you please stop staring?” Brier’s face grew redder as he fumbled a square dark box in his hands. Roland chuckled wryly at the honorific. “I don’t need your fake titles or smiles, but a thank you would suffice.” He handed Brier the piece of bread. There was a brief pause before the prince extended his hand in apology. Roland sighed and leaned back on the palms of his hands. An Aurelian feels indebted to me? “A few times?” Roland eyed Brier dubiously. “All right, plenty of times.” He rolled his eyes. Roland yawned and laid fully on the ground. He stared at Brier, listening to the rain plunk against the patent leather exterior. “Stations change, but people do not.” No matter what he did or where he went, he would always be who he was. No amount of good deeds would wipe out his past. “Marietta always says fate is the only thing that is constant in this world, but….” Brier’s smile faltered, and Roland felt a pang in his gut. “You don’t believe her?” Roland asked. “Am I to be bound to you by duty alone?” Brier eyes jerked upward and Roland tilted his head, waiting. Why indeed? Roland thought, gazing at the timid boy. “’Tis not a loss of confidence, but a realization, Roland. Mayhap… mayhap I am not fit to be a king.” Brier watched him with questioning eyes. Even though Brier did not say it aloud, Roland understood. The prince was afraid: of the unfamiliar path with no one to guide him; a longing in the prince’s heart that was once sated with love; the insecurity of never being good enough. Roland understood it because he felt it every day of his life. “Whose authority is it to say that you will?” Roland challenged. “And look where that led us,” Brier scoffed. The prince looked so exposed then, with his red rain-slicked hair and his lean body peeking through the blanket meant to shield him. Roland raised his hands and covered Brier’s cheeks. “I don’t know the answer to that,” Roland replied honestly. “Though I must say, I have never met someone quite as stubborn as you, little prince.” Brier’s mouth twisted upward, and Roland grinned, satisfied at the effect of his words. A real smile. If Roland had his way, Brier would always laugh and smile. Roland moved his thumbs gently across the fire-like blush spreading through his cheeks. Like petals in early spring, Roland was surprised at how soft Brier’s skin was on his fingertips. Then he leaned in and stared at the boy’s pink lips. Thinking how much he’d like to see for himself just how supple they were. Thinking how different he and the prince were, and why fate, as Brier had called it, brought them together. Roland swallowed. At that moment, a trickle of heat slid down his body and settled in his groin. “Roland….” Brier whispered, smile long vanished. Brier did not pull away, but there was panic and uncertainty in his eyes. Roland removed his hands from Brier’s flushed cheeks when reason tugged at the back of his head. “Finish your bread and rest,” Roland told Brier quietly. He rolled over to dim the oil lamp in their tent. And what the hell was that? He laid down on the blanket with his heart pounding. He knew exactly what that was, and he hadn’t felt it in years. Brier finished the last piece of bread, wrapped up in the wool blanket, twisted away from the oil lamp, and did not say another word. Roland waited until he heard the gentle rhythm of Brier’s breath before he turned and watched the prince sleep. Roland exhaled deeply to cool his head, wishing he had a strong ale instead.